The 21.95 metre sailing yacht Geometry, listed for sale by Dbeere Yachts, has recently been given a €400,000 price reduction. Built in carbon fibre by experienced shipyard Seaways, Geometry was delivered in 2009 and has been consistently well maintained since. Designed for both high performance racing and comfortable cruising, Geometry is seriously for sale – with Dbeere Yachts revealing she must be sold this season. Geometry's J & J Design interior features a light and spacious saloon, surrounded by large windows that flood the room with natural light. The Galley is accompanied by a large U shaped tan leather sofa and seating area up to 8 people. Eight guests are accommodated in three cabins. The master cabin features a double berth, settee, dressing table, large wardrobe and an en-suite bathroom. The starboard aft cabin and port aft cabin both have en-suite heads with a separate shower. Two crew are accommodated in the crew cabin forward, which includes twin bunks and heads and shower. 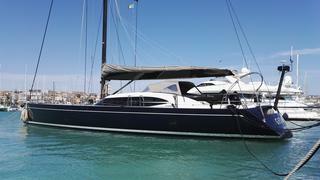 Geometry is an ideal choice for Mediterranean cruising and extremely seaworthy in all conditions. With comfortable cruising speed of 20 knots comes a Volkswagen TDI 265 281hp engine. Currently located in Italy, Geometry is down from €1,995,000 to €1,595,000.